As I mentioned in a previous post, I love looking at www.houzz.com for design inspiration. When it came time to remodel the guest bathroom I spent hours on that site gathering design ideas. 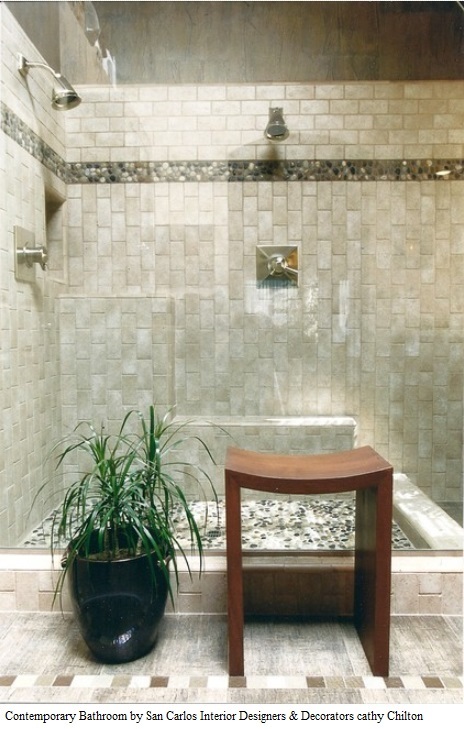 When I came across this tile design on houzz (on the left), I knew it was exactly what I wanted for the shower. I loved how the tiles were vertical below the accent tiles and horizontal above. For my shower (on the right) I used beige travertine tiles and brown glass accent tiles. I would have loved to have done the pebble flooring but we decided to re-use the existing shower pan instead of tiling the floor. Here is a close-up of the glass accent tile.